REAL TIME WITH BILL MAHER continues its 16th season FRIDAY, AUG. 10 (10:00-11:00 p.m. live ET/tape-delayed PT), with a replay at 12:30 a.m., exclusively on HBO. Allowing Maher to offer his unique perspective on contemporary issues, the show includes an opening monologue, roundtable discussions with panelists and interviews with guests. Anchor Lawrence O’Donnell is the top-of-show interview guest. Psychologist Steven Pinker is the mid-show interview guest. The roundtable guests are journalist Christina Bellantoni, comedian D.L. Hughley and Mass. Rep. Seth Moulton. The show is also available on HBO NOW, HBO GO, HBO On Demand and partners’ streaming platforms. REAL TIME WITH BILL MAHER has already been renewed through 2020. Maher headlined his first special on the network in 1989 and has starred in 11 HBO solo specials to date, including the recent “Bill Maher Live from Oklahoma.” He is also an executive producer of the innovative news magazine show “VICE,” which is now in its sixth season on HBO. 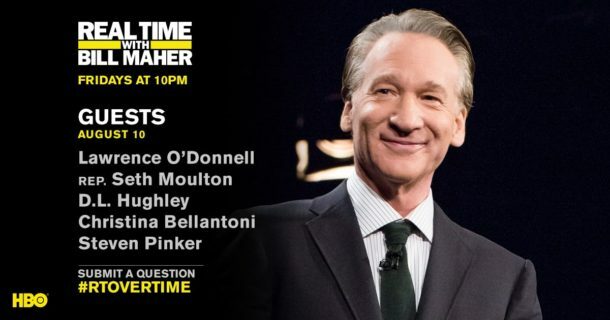 The executive producers of REAL TIME WITH BILL MAHER are Bill Maher, Scott Carter, Sheila Griffiths, Dean Johnsen, Billy Martin; co-executive producer, Chris Kelly; producer, Matt Wood; co-producer, TJ Baldino; associate producer, Miles Leicher; director, Paul Casey.